Mattias Thambert, the creator of Refurn, rescues furniture from recycling stations in Stockholm to give them a second life. 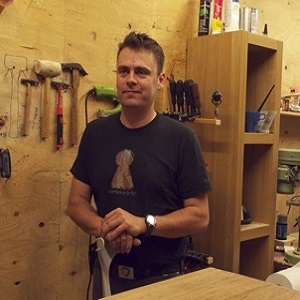 Mattias, his company and countless volunteers collect the discarded furniture, make repairs and sometimes redesigns before selling them again to a new home. His vision is to make the reuse of furniture the default for our culture and in that way halting the vicious cycle of short lived furniture made at a massive scale from virgin materials. Summary: Mattias’ answer to the five questions! Listen to the full conversation on the player above; also available on iTunes and Stitcher. There are so many people and even pets. There is some kind of force, like Luke Skywalker Star Trek, there is a force that picks me up when it’s really, really dark. With God, there is hope. That’s not it (cancer). I had more hardships both business-wise because this vision about changing the way we do business and changing the way we destroy nature into doing something that really works long-term…It was just me a and a few others that did this 20 years ago. They almost thought I was crazy when I was talking about these visions so many years ago and now everyone knows that we have to do something basically to survive. Sometimes, even the past year, I seriously thought I was going to die and facing that at my age is very inhumane. At some points I almost had to lose hope in order to really find it. Even in and after death, there is hope. I think there is hope all the way. I guess the lesson for me has been to learn to see hope always and to learn not to fear anything. Fear puts me back. Back in the 90s when I lived abroad, I learned that I will never succeed without persistence. I have now realized that it takes a stupendous amount of this to succeed especially when trying not to compete in business, but to do things in a whole new way. I was even considered crazy for saying what I wanted to do before it existed. Basically, what we do in Refurn is saving discarded furniture and items from dumps and giving them new life. We have a social vision and about half our staff has some form of handicap and some even work on a volunteer basis. Our aim is for the people of the world to start restoring old things instead of buying new. I feel like we are a David against Goliath where Goliath is the industry that makes zillions of things from virgin, natural resources. Refern competes with giants. At this point, most people has already realized that we have to do something and that there is a limit to how much we can exploit nature. Most people simply feel good getting their hands dirty with Refurn. I don’t want to go too deep into that, but I went through some serious stuff and I came out of it. I decided that I want to help others with handicaps, physical or mental, I don’t care. I want to help other people get back on track and give people another chance. I really, really want to do this from my heart – the social part. The other part is saving things from the dump, there is no economy in doing that. It takes three hours to fix an old chair and you can sell it for 5 bucks. There’s no way to live off of this unless something is changed. The economy is one thing, but there is a genuine desire to help. There is so much to fix. There are so many broken items that takes a long time – we could take away the unemployment, but we have to find a way to make it work financially. There is so much to do really. Facing death, there is even hope there. There is hope all the way there. There is nothing to worry about. I paid such a hard price. I went through so many things. A lot of the price is because of this vision. There are so many times that I almost gave up. Everything is really not going my way. Because I didn’t lose hope, it finally took off. It’s working now. We’re growing fast. (1) Be one of the many people who make kindness their second nature. (2) Be respectful of everything.